EGU Blogs » GeoLog » GeoTalk: How will large Icelandic eruptions affect us and our environment? Meet Anja Schmidt, the winner of a 2018 Arne Richter Award for Outstanding Early Career Scientists, pictured here in front of Teide volcano in Tenerife, Spain. Credit: Anja Schmidt. Geotalk is a regular feature highlighting early career researchers and their work. 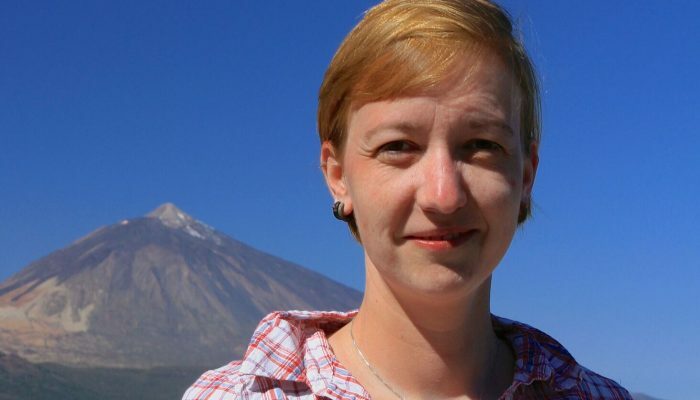 In this interview we speak to Anja Schmidt, an interdisciplinary researcher at the University of Cambridge who draws from atmospheric science, climate modelling, and volcanology to better understand the environmental impact of volcanic eruptions. 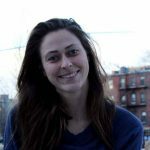 She is also the winner of a 2018 Arne Richter Award for Outstanding Early Career Scientists. You can find her on twitter at @volcanofile. I was born and raised in Leipzig, Germany. I started my career completing an apprenticeship as an IT system engineer with the engineering company Siemens. I then decided to combine my interests in geology and IT by studying geology and palaeontology (with minors in Computing/IT and Geophysics) at the University of Leipzig in Germany. As part of my degree programme, I also studied at the University of Leeds’ School of Earth and Environment as an exchange student. I liked studying there so much I ended up returning to Leeds for a PhD. My PhD on the atmospheric and environmental impacts of tropospheric volcanic aerosol again combined my interests in computing and volcanology, although I had to educate myself in atmospheric physics and chemistry, which wasn’t easy to begin with. However, I was embedded in a diverse, supportive research group with excellent supervision, which eased the transition from being a geologist to becoming a cross between an atmospheric scientist and a volcanologist. Initially, being neither one nor the other made me nervous. My supervisors and mentors all had rather straightforward career paths, whereas I was thought of as an atmospheric scientist when I presented my research in front of volcanologists and as a volcanologist when I presented to atmospheric scientists. After my PhD, I spent just under 2 years at one post-doc before securing an independent research fellowship at the University of Leeds. The first year of total independence and responsibility as principle investigator was very challenging, but after a while I began to appreciate the benefits of the situation. I also really started to embrace the fact that I would always sit between the disciplines. I spent my summers in the United States at the National Centre for Atmospheric Research, helping them to build up their capability to simulate volcanic eruptions in their climate model. These research visits had a major impact on my career as they generated a lot of new research ideas, opened up opportunities and strengthened my network of collaborators greatly. I considered myself settled when, shortly before the end of my fellowship, a lectureship came up. It had the word ‘interdisciplinary’ in its title and I simply couldn’t resist. Since September 2017, I have been an interdisciplinary lecturer at the University of Cambridge in the UK. At this year’s General Assembly, you will receive an Arne Richter Award for Outstanding Early Career Scientists for your work on the environmental impacts of volcanic eruptions. What brought you to study this particular field? I have always been fascinated by volcanic eruptions, but my first active volcano viewing wasn’t until college, where I had to chance to travel to Stromboli, a volcanic island off the coast of Sicily. While studying at the University of Leipzig, I used every opportunity to join field trips to volcanoes. I ended up spending 10 weeks in Naples, Italy to work with Giovanni Chiodini, a researcher from the National Institute of Geophysics and Volcanology in Rome, and his team on CO2 degassing from soils at the Solfatara volcano. Later on I was awarded a scholarship from the University of Leeds, which allowed me to delve deeper into the subject, although I ended up learning as much about atmospheric science and computer modelling as about volcanology. Anja in front of the 2010 Fimmvörðuháls eruption in Iceland. Fimmvörðuháls was the pre-cursor eruption to Eyjafjallajökull. Credit: Anja Schmidt. My PhD work focused on Icelandic volcanism and its potential effects on the atmosphere as well as society. In 2010, during the 3rd year of my PhD studies, Eyjafjallajökull erupted in Iceland. While an eruption like this and its impacts did not really come as a surprise to a volcanologist, I personally considered it a game-changer for my career. 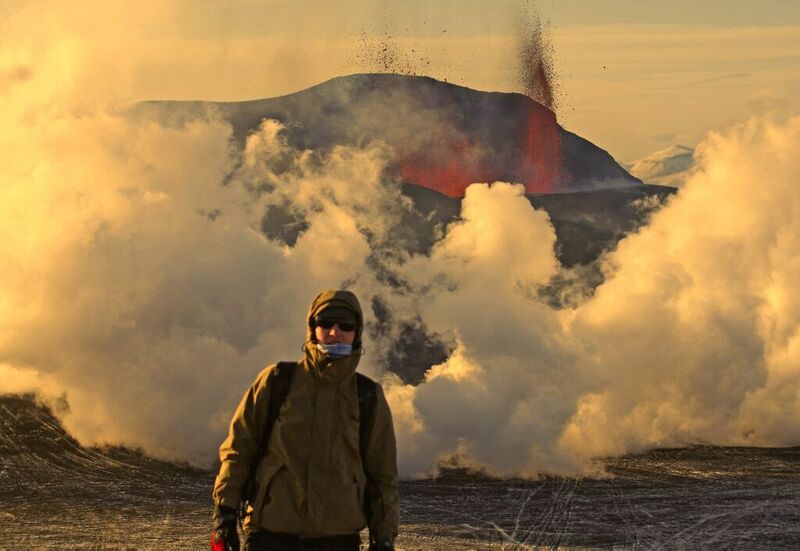 I had an opportunity to witness the pre-cursor eruption in Iceland and present my research. Within a matter of months, interest in my work increased. I even started to advise UK government officials on the risks and hazards of volcanic eruptions in Iceland. In August 2014, an effusive eruption started at the Holuhraun lava field in Iceland. To this date, analysing field measurements and satellite data of the site and modelling simulations keeps me busy. Many of my senior colleagues told me that there is one event or eruption that defined their careers; for me that’s the 2014-2015 Holuhraun eruption. At the General Assembly you also plan to talk about your work on volcanic sulphur emissions and how these emissions can alter our atmosphere as well as potentially affect human health in Europe. Could you tell us a little more about this research? On average, there is one volcanic eruption every three to five years in Iceland. The geological record in Iceland also reveals that sulphur-rich and long-lasting volcanic eruptions, similar to Iceland’s Laki eruption in 1783-1784, occur once every 200 to 500 years. Sulphur dioxide and sulphate particles produced by volcanic eruptions can have detrimental effects on air quality and human health. Historical records from the 1780s imply that the Laki eruption caused severe environmental stress and contributed to spikes in mortality rates far beyond the shores of Iceland. While these long-lasting eruptions occur much less frequently than more typical short-duration explosive eruptions (like Grímsvötn 2011), they are classified as ‘high-impact’ events. I was always interested in investigating how a similar magnitude eruption like Laki’s would affect modern society. By combining a global aerosol microphysics model with volcanological datasets and epidemiological evidence, I led a cross-disciplinary study to quantify the impact that a future Laki-type eruption would have on air quality and human health in Europe today. Our work suggests that such an eruption could significantly degrade air quality over Europe for up to 12 months, effectively doubling the concentrations of small-sized airborne particles in the atmosphere during the first three months of the eruption. Drawing from the epidemiological literature on human response to air pollution, I showed that up to 140,000 cardiopulmonary fatalities could occur across Europe due to such an eruption, a figure that exceeds the annual mortality from seasonal influenza in Europe. In January 2012, this discovery was used by the UK government as contributing evidence for including large-magnitude effusive Icelandic eruptions to the UK National Risk Register. This will help to mitigate the societal impacts of future eruptions through contingency planning. 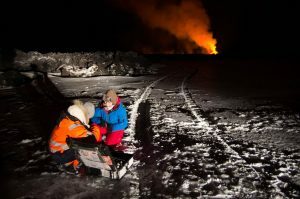 Anja and her colleague Evgenia Ilyinskaya from the University of Leeds carrying out measurements during the 2014-2015 Holuhraun eruption in Iceland. Credit: Njáll Fannar Reynisson. Since then, we have done more work on smaller-magnitude effusive eruptions such as the 2014-2015 Holuhraun eruption in Iceland, showing that this eruption resulted in short-lived volcanic air pollution episodes across central and northern Europe and longer-lasting and more complex pollution episodes in Iceland itself. Something that you’ve touched on throughout this interview are the challenges of ‘sitting between the disciplines.’ From your experience, what has helped you address these issues throughout your career? Indeed, it is often challenging to sit between the disciplines, but it can also be very rewarding. It helps to ignore boundaries between disciplines. I also tend to read a lot and very widely to get an idea of key concepts and issues in specific fields. In addition, I think collaboration and a willingness to challenge yourself are key if you want to make progress and break traditional disciplinary boundaries. Anja, thank you so much for speaking to us about your research and career path. Before I let you go, what advice do you have for aspiring scientists? Be curious and never hesitate to ask a lot questions, no matter how ‘stupid’ or basic they may seem to you. The latter is particularly true when it comes to cross-disciplinary collaboration and work. I also didn’t always follow the conventional route most people would advise you to take to achieve something. Never be afraid to take a chance or work with some level of risk. I also have two or three close mentors that I can approach whenever I require some advice or feedback. No matter what career stage you are at, I think it almost always helps to get an outsider’s perspective and insight not only when there are problems. Finally, never forget to have fun. Some of my best pieces of work were done when I was surrounded by collaborators that are really fun to be with and work with! Interview by Olivia Trani, EGU Communications Officer.